The South Asia action-reaction dynamics and complex strategic geometry, forces India and Pakistan to maintain qualitative and quantitative edge in strategic weapons. Both nuclear neighbors are tangled in traditional security competition and enhancing their strategic force capabilities rapidly. India’s pursuit of sophisticated technology and long-range ballistic missile development has not only made Pakistan more determined to acquire similar capabilities to counter Indian threat but also to ensure credibility of its nuclear deterrence. Long history of military confrontation, the growing asymmetry and disparity in South Asia has accelerated the process of mastering the latest sophisticated conventional and nuclear technologies. Therefore, both South Asian nuclear states have developed enough nuclear capable warheads, bombers and ballistic and cruise missiles. In year 2017, significant developments in the nuclear geometry of South Asia have been witnessed. The acquisition of sophisticated nuclear technologies, missile testing, introduction of new delivery system and improved payload, ranges, accuracy and reliability of missile programs indicate the shifting nuclear policy and trends in South Asia. India’s weapons build up and modernization spree underscores its shifting nuclear doctrine and force posture. This change is in line with India’s ambitious and hegemonic designs that it has started to pursue vigorously ever since its strategic partnership agreement with the US ostensibly to counter and curtail Chinese influence in the region and beyond. Thus, there is not an iota of doubt that India has increasingly moved towards the adoption of offensive strategies which is clearly reflected by its frequent tests of sophisticated nuclear weapons and technologies. The fact that India conducted 17 missile tests in the year 2017 speaks volumes of its destabilizing behavior and unfortunately the US and much of international community continues to turn blind eye to these developments at its own peril. While both Pakistan and India test fired short-range ballistic missiles (SRBM), medium-range ballistic missiles (MRBM) and submarine-launched cruise missiles (SLCM), India took lead vis-a-vis Pakistan by exclusively testing sub-sonic and supersonic cruise missiles from multiple platforms. 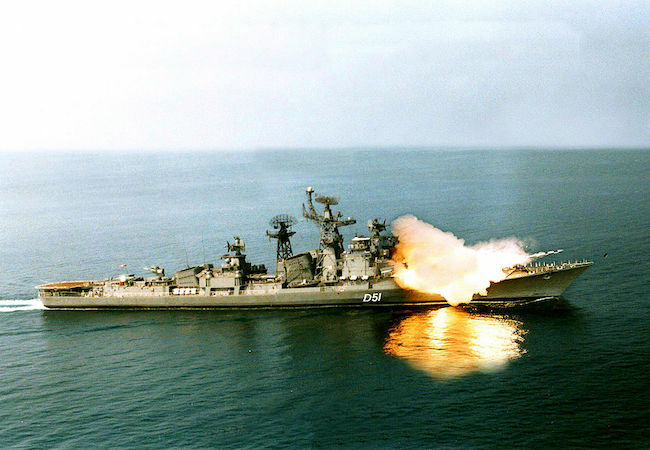 Of particular concern to Pakistan and neighboring countries of India, are its tests of the submarine-launched K-4, the air-launched BrahMos, and Nirbhay missiles which reflect the operationalization of India’s nuclear triad and ambitions of strengthening BMD. The most notable strategic development is launch of NS Arighat on November 19, 2017. NS Arighat is the second Arihant-class submarine. If it were not enough for India’s defence purposes, India has been pursuing advanced technologies for its nuclear-armed missiles. To this end, India’s testing from canister-based launch systems, which generally require the nuclear warheads to be mated to the missile at all times jeopardizes the delicate strategic stability and deterrence stability in South Asia. Nevertheless, Pakistan has been trying hard to avoid being drawn in the costly arms race by relying on the doctrine of Minimum Credible Deterrence. On its part Pakistan has tested its newly-developed Babur-III (SLCM) and the Ababeel (MIRV), which has multiple independently-targetable re-entry vehicle (MIRV) capability. It is said that Ababeel (MIRV) will facilitate Pakistan to sustain the credibility of its deterrence strategy and neutralize the Indian BMD system due to its ability to deliver multiple warheads. Moreover, India aims to extend the range of conventional and nuclear precision strike systems and inducting platforms to execute preemptive first strikes, such as the integration of the BrahMos with Su-30 MKI fighter bombers to further enhance India’s strategic force capabilities. Indian pursuit of Ballistic Missile Capabilities and BMD system has complicated the security calculations of regional states. Nevertheless given India’s shift towards offensive or war fighting strategies, Pakistan’s strategic restraint are concerned as India’s offensive force posture has potential to destabilized strategic stability. It is imperative for Pakistan to take effectives measure to counter the volatility instigated by Indian Ballistic Missile tests- such as Agni II and Agni-V. In response to most recent test of Agni V, Regional states have also shown their concerns such as Chinese Foreign Ministry spokeswoman stated that “preserving the strategic balance and stability in South Asia is conducive to peace and prosperity of regional countries.” This represents that India’s ballistic missile developments demonstrate a significant shift in deterrence postures of regional states. It is viewed that introduction of new delivery systems and extended ranges of Ballistic and cruise missiles developments will have a spillover affect on its neighboring states thus triggering and consolidating a new missile race in the region which is comprised of three nuclear weapon states: China, India and Pakistan. However, the most significant developments in South Asia in the year 2017 were: first, the finalization of “Nuclear Triad” by both India and Pakistan; second, development of Second Strike Capability; third, India’s admission into Wassenar Arrangement and Missile Technology Control Regime (MTCR). Indian Admission in to Wassenar Arrangement (WA) soon after its admission into MTCR shows that India is rapidly incorporated among the nuclear weapon states. The continued growth of India’s missile inventory and military modernization of its conventional and nuclear forces pose an unprecedented complication for Pakistan’s security and regional stability. Many strategic experts agree that the security environment in South Asia is complex as India’s robust modernization and enlargement of its conventional and nuclear forces is challenging for Pakistan. In this regard, Pakistan believes that its pursuit of sophisticated nuclear capabilities and missile program appears to be a logical response to counter Indian aggression by maintaining credible minimum deterrence.